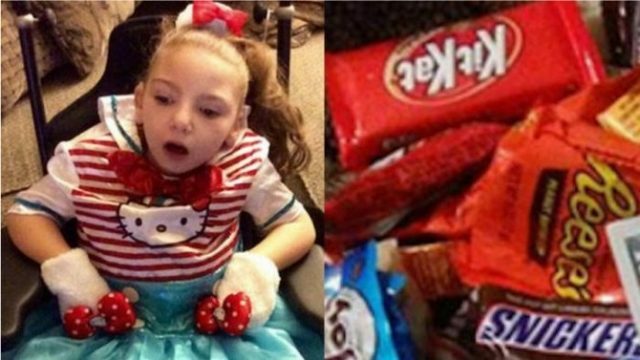 A California man has shown an amazing act of kindness toward a young disabled girl who came to his house to trick-or-treat. Timothy Joe Winn of Antioch, California, said that he and his daughter Alyssa, 6, were trick-or-treating at a man’s residence on Bethel Island when the he slipped what Winn initially thought was a $10 bill into Alyssa’s bag, CBC San Francisco reports. “This is for the wheelchair maintenance,” the man told Winn, according to East County Today. When Winn and his daughter got home and started looking through Alyssa’s candy, however, they realized that the man had actually given them a $100 bill. Winn, who shared the discovery with his wife, told CBS San Francisco that he was shocked by the generous gift. “It’s just over the top,” he said. Alyssa suffers from cerebral palsy and a degenerative brain disease, and cannot move around without the help of a wheelchair. After East County Today shared the story on Facebook, users of the social media site showered the anonymous man with praise for his thoughtful act. “Its nice to know there’s still good people out here,” one commenter wrote. “Wonderful way to help ease someone’s burden,” another post read. Alyssa’s mother, Rachelle Metcalf, also posted in the comments section. “The random acts of kindness are amazing,” she wrote. “Pay it forward has always been my way of living life. The Facebook post about the man’s good deed has since gone viral, garnering 1,157 “likes” and 176 “shares” as of this writing.